Tagged under A-1 Pictures, Broccoli, Drama CD, Games, Series. The humor and romance are equally presented in this anime and are very equal. The jokes are hilarious and they really do not get old. I can still watch Season 1 and die of laughter from the pranks and the jokes. The characters appeal is perfect and they appear like a normal anime reverse harem. There are a ton of WTF moments but thats just the kind of anime that is. Please do not forget that this anime came from the game so they did their best to explain it ALL to the audience but with only 13 episodes they did assume that the audience wouldn't be stupid and could figure small things out or have the brains to go look it up online if they were curious. Первые два сезона были лучше, 3 полный слив. Оценку я выставила только за первые 2. И так история повествует о девушке, которая почти нечего не умет, кроме как улыбаться. Потихоньку она соберет гаремник, который с каждым сезоном становится больше и больше. Смысл, он был только в первом сезоне, во втором осталась небольшая тень этого смысла, которая потихонечку сбежала. А про третий я промолчу. The first season seems to have rough start but the second season does a much better job of adding character depth, interest, and more reasons for me to like them as a whole. I recommend this anime if you know exactly what to expect in this anime and ask for no more than it truly can give. I watched this series while I was bored and it made me genuinely laugh at times (Syo is the most adorable guy ever; so is Natsuki) and at times it truly did pull at my heartstrings. I think this anime does well for the genre that it is within but the first season, at least for some characters, has a rough beginning but it gets better as it goes along. 1-Nanami, Haruka. She's just unbelievable, i hate everything in her, starting with the stubid look on her face and creepy eyes and ending with her... Well ,everythig!!. 2-All mains who likes her just because she walked near them by accident. 3-My opinion: the ending theme makes me feel stupid, i don't know how they could respect themselves after this. 10-Very stupid and pointless there-to-look-good bishies. I've got lots of things but then this would last forever. PS:don't say that my negative opinion Because i don't like such an anime genre..... because i really like it but this one is awfully different!! I'm not very fond of otome-based animes, because the main female character is usually stupid or too happy for me... But in this case, I loved the male characters and their songs, so I watched it completely. My favourite one is Syo, and I really like his voice and style! I've watched the first series and now currently watching the second season after being aired. I love the series, especially the characters of this series. Seriously. Yeah. No wonder there's a ”Maji Love” on the title. This series will seriously (Maji) make you love (Love) them 1000% (1st season) up to 2000% (second season)! ITTOKI OTOYA <3 ICHINOSE TOKIYA <3 ERMAGHERD. i saw the first season and i didn't like the story, it's so predictable, i completed it because i liked the graphics and the art ONLY ! then i heard about a sequel for this anime i thought the story might getting better, but sadly it getting worse!, and even the songs it's much horrible than the 1st season, when i saw the second season Maji love 2000% it make me like the first one because it's much much much horrible than the first one (regarding the terrible Dances !!! and the awe full costumes!!! ), and i hate the HEAVENS very much they are so ugly!, any way ,like i said i completed it because of the art and the graphics and because of the new character, Camus he is so handsome ^^, and his band QUARTET★NIGHT is sooooo beautiful and better than STARISH in my opinion, and QUARTET★NIGHT song is the most beautiful thing in Uta no Prince Sama ! well, i saw season 2 and honestly the season is not much as season 1, first the songs in season 1 is much better than season 2, the ending song love maji 2000% is simply horrible, everything in it is horrible, the lyrics, the music, starish costumes and the stupid dance of them, and there is me thing else, who is the idiot that told "cecil" that his voice is beautiful ? i didn't like his voice at all, and also there is the HEAVENS, they are so so so ugly, in their look and in their action and everything, any way, let's about the things i like in this anime, i like the graphics and art, it is awesome, i loved very much the songs Feeling Heart and Poison Kiss, they are amazing, i love Quarter Night band very much, however they did good when they end season 2 with Love Maji 1000% cause it's really much better than 2000%. I definitely had a great time watching this series. It has everything I love--great music plus bishies (makes you wish you could be the one in Nanami Haruka's shoes) :) Watching this makes me wish that there is such a school as theirs here. It seems like so much fun...you make songs, listen to music, and learn how to become a popstar or composer! And the school itself is just lovely! I also love how every character each has their own distinct personality (which was also reflected in their bedrooms haha...if you watched the series, you'll know what I mean). 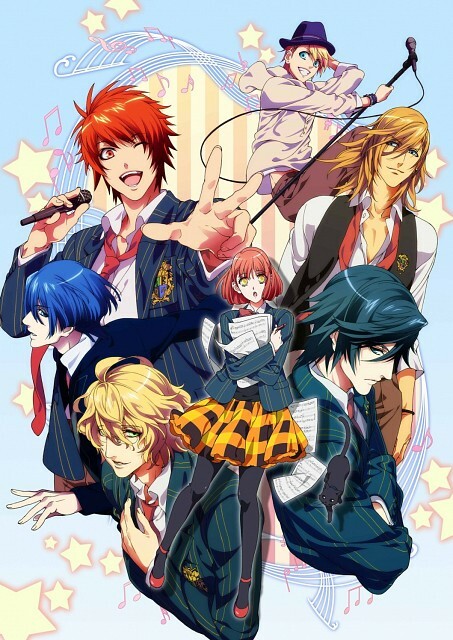 No feedback on Uta no Prince-sama.